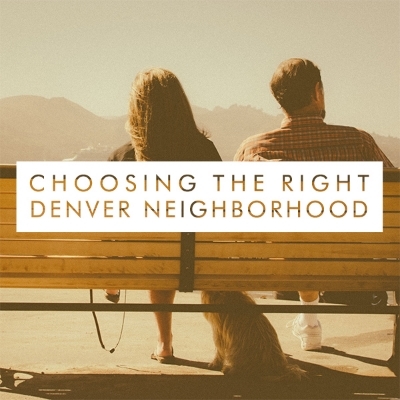 Choosing a neighborhood is a difficult decision, made even more difficult if you’re moving to Denver from out of town and aren’t familiar with the area. Once you’ve done your online research and checked out our neighborhood guides for Denver and south metro Denver, it’s time to get in touch with a Realtor that can be your guide while trying to find your best neighborhood match. Maybe you have months to search for the perfect neighborhood, maybe only a weekend if you’re coming from out of town to explore but first and foremost, communication is key. Consider Lifestyle — Do you love going to concerts? Need to be close to your studio? Your lifestyle might make finding the perfect match easier than you think. Communicate what the most important aspects of your life are with your agent and you’re on the right track. Consider Future Appreciation — Is creating sweat equity your goal? Want to invest in a property? Some neighborhoods are better for this than others- your agent will help you narrow it down. Consider Budget — What can you afford? What are you comfortable spending? You can almost always find a property that falls into your budget in your desired neighborhood if you are willing to compromise. Don’t get scared away from a neighborhood because you see a million dollar listing on the market. Consider Proximity — Is great nightlife is important to you? Frequent Broncos games at Invesco and would love to skip the parking hassle? What are the important places in your life that you need to live nearby? Consider Schools — Do you have kids? Are you thinking you may want them in the future? Doing research on school districts can help you decide a location that’s a good fit for you. Consider Shopping and Dining — Is shopping at Whole Foods important to you? There are only a few locations in Denver. Remember, it’s all about personal preference and how much you’re willing to travel to get to the destinations you love. Consider Safety — It is so important that you feel safe in your home, and the feeling of “safety” varies from person to person. Do some research on crime rates in specific areas before you choose to buy a home there. Your real estate agent can help you get access to this material or you can call the local police station for a report. Consider Your Commute — It may seem like a no-brainer, but if you hate sitting in traffic, why not choose a neighborhood close to your work? Perhaps a neighborhood close to your children’s school? Consider Transit Access — Denver and metro Denver has Lightrail which provides comprehensive public transit throughout the front range. If you don’t own a car, or don’t wish to commute, choosing a neighborhood based on proximity to a light rail station or availability of bus routes will be helpful to you. Your Realtor should be able to take all of the information you provide them and come up with a handful of neighborhoods that are a good match for you. The Goetz Group often spends a whole day driving out-of-town clients around the city and metro area to give them a feel of what many neighborhoods are like. Choosing a neighborhood is a big decision, and not an easy one! Let us know how we can help.